Forest Boyce and Eighttfasttocatch. Photo by Jim McCue, Maryland Jockey Club. One man couldn’t stop talking. One man fought back tears. Funny how we react, each in our own way, to what — to the outside world, at any rate — is essentially the same stimulus. Yet after two of Saturdays’ biggest regional races — the Maryland Million Classic and Turf at Laurel Park — a panoply of human emotion was on display. Every win’s a good win, trainers will say, and surely that’s true; but some wins are more than just wins. 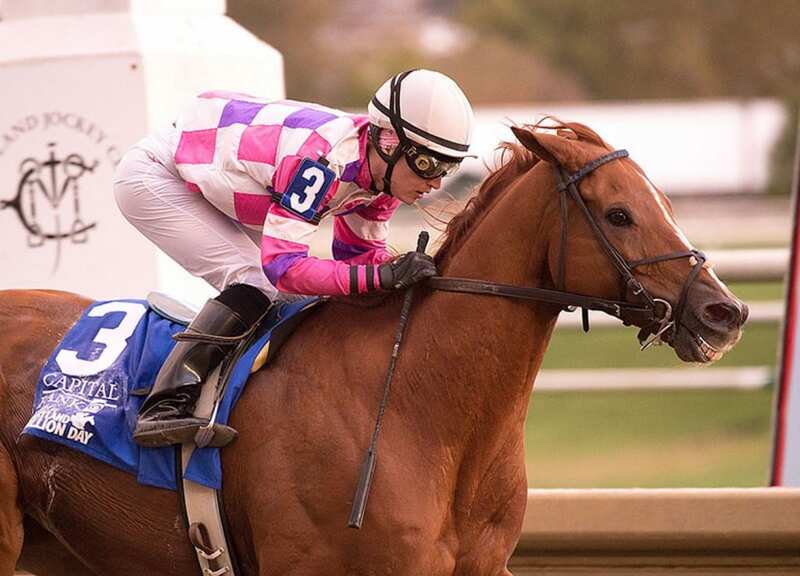 Veterinarian Michael Harrison’s homebred Talk Show Man won the Maryland Million Turf and spoiled what most of the crowd had hoped would be a celebration of Ben’s Cat’s record-breaking fourth Maryland Million win. Ben’s Cat disposed of old rival and defending champ Roadhog but could not withstand the late run of Talk Show Man, the horse Ben’s Cat’s trainer, King Leatherbury, had said he feared most. A legend, indeed, and yet, like all legends, a flawed one, his specific flaw being the distance limitations that, Maryland Million having canned the Turf Sprint prior to last year, forced him to run either in the Turf — at a one-mile distance that’s a shade too far — or in the Sprint, on dirt, a surface on which he is a shade less good. It was the first career stakes win for Talk Show Man, a four-year-old by Great Notion out of the winning Haymaker mare Mark Me Special. Two back, he’d run second, in the Cape Henlopen, to Hardest Core, who then won the Grade 1 Arlington Million. More recently, he ran fifth in an allowance, beaten less than three lengths; the third place finisher that day, Manchurian High, returned to take the Laurel Turf Cup. A representative of HRTV bustled over and told Harrison that the station would like to interview him on-air. Frequent on-air types know the drill: drop everything and give TV what it wants. Harrison turned to leave the day’s most boisterous winner’s circle, then turned back once more. “Very special,” he said. One race later, in the Maryland Million Classic, the crowd got what it wanted when eight-year-old Eighttofasttocatch scooted to the early lead, controlled the pace under jockey Forest Boyce, and rolled to a 4 1/2 length victory, becoming the first horse to win three editions of the Classic. Eighttofasttocatch is slated to make one more start, in the Jennings at Laurel, before retiring to his next career. For trainer Tim Keefe, the moment was bittersweet. He sniffled, his eyes red-rimmed, as he came into the winner’s circle. Around him, it seemed that everyone’s arms were open, and he fell into one hug after another. The winner’s circle was full, yet somehow empty, too; not present were Arnold Heft, who owned Eighttofasttocatch before passing away in March, and Keefe’s father, who passed away in May. Talk Show Man gets up late to win the Turf. Photo by Jim McCue, Maryland Jockey Club. The win was Eighttofasttocatch’s 16th, his 11th in stakes company, and it pushed his earnings to just shy of $1 million: $997,970, to be exact. The gelded son of Not for Love — one of four Not for Loves to win on the day — out of the stakes-placed Nice Catch mare Too Fast to Catch, enjoyed his best season in 2013, when he won four races and over $350,000, including a second-place finish in the Grade 3 Pimlico Special. In the end, though, it wasn’t a day for sadness, and Keefe turned, as trainers are wont to do, to the details. Someone asked him about the opening quarter mile, which Boyce and the horse navigated in a pedestrian 24 seconds flat. “That was sweet,” he said with enthusiasm.